Alpine Adventure Rentals has new model year 3-person Personal Watercraft. Watercraft can be towed to Palisades Reservoir, utilizing any of the local boat launches. Lifejackets included with your rental. Full Day rentals 9:00 to 5:00, Half Day Rentals 8:30 to 12:30 or 1:00 to 5:00. How do Boat and Watercraft Rentals Work out of Alpine? Our Alpine located just 30 miles south of Jackson Hole Wyoming and provides direct access to the Palisades Reservoir. Our Boat & Watercraft rentals are available delivered to the waterfront ready for your family and friends to enjoy or loaded on a trailer ready to tow to your preferred boating destination. With full and half day options, safety gear, ski/wake board equipment, and plenty of boating accessories we have everything you need to enjoy a day on the water. What security deposit is required to rent watercraft? For Watercraft (Sea Doos) we do not require a pre-authorization hold. The optional damage waiver to limit your liability on the watercraft is $35/day with a $1000 deductible. Can I rent boats for Jackson lake instead of Alpine Wyoming? Personal watercraft (Sea Doos) are not allowed on Jackson Lake or Jenny Lake. 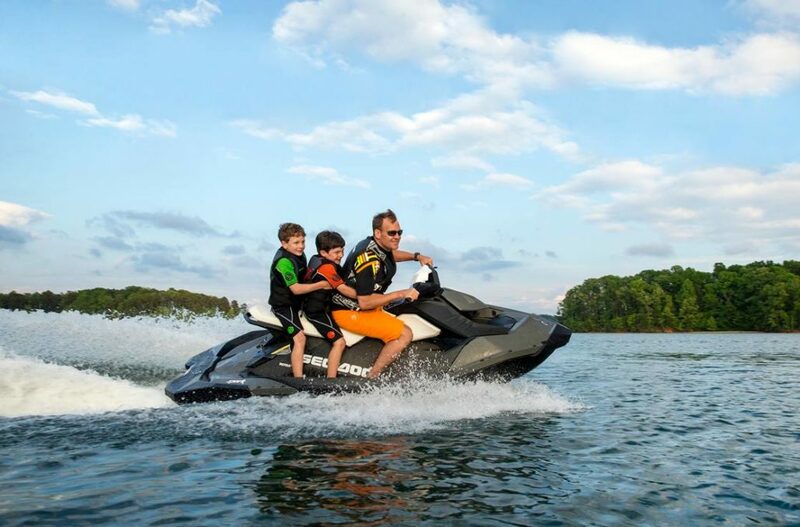 What are the age requirements for watercraft rentals ? Under 18 can ride Sea Doos if tethered to an adult. What equipment is included in the watercraft rental? Do you Allow Multi-Day Rentals? Full Day Rental – 9am-5pm. What about fuel? Delivery? Insurance? All of our equipment loaded on a trailer leaves full of fuel and will need to be returned full of fuel. If your watercraft was delivered to the waterfront in Alpine we charge a simple base fuel rate. How much do the Watercraft weigh for towing? Hitch Size?